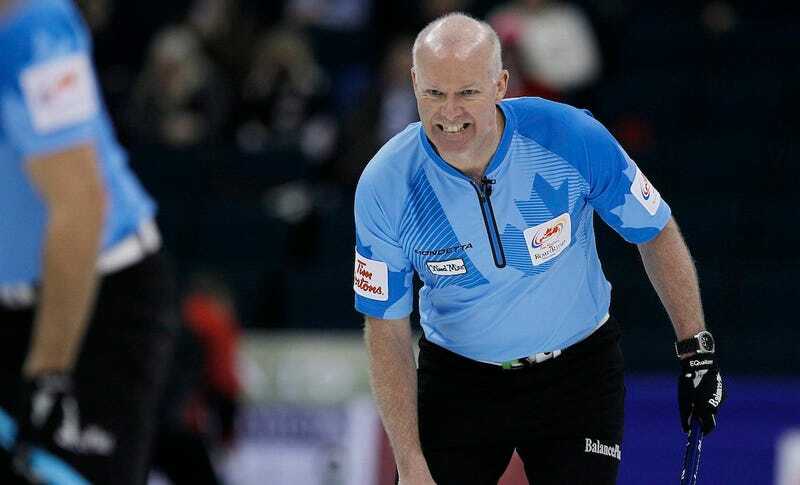 Glenn Howard has been one of Canada’s top curlers for years, and the four-time world champion is again attempting to represent Canada in the 2018 Winter Olympics. The master strategist and his team, ranked 17th in the world and 11th in Canada, qualified for the opening round of the Canadian curling trials. The team consisting of Howard, Richard Hart, David Mathers, and son Scott Howard is the defending Ontario provincial champion and will play in the pre-qualifying Road to the Roar this November in Summerside, Prince Edward Island. Why is this noteworthy? Glenn Howard is 55, 12 years older than any other skip in the field. Glenn Howard has already agreed to coach the Great Britain women’s curling team. First the queen is still on Canadian currency, now this. British skip Eve Muirhead already has an Olympic bronze medal in her trophy case and will no doubt benefit from an extra dash of guidance from a curling legend to grab a better color next year. That is, of course, unless he wears the maple leaf as an athlete, in which case the advice when they play Canada might boil down to Uh, try to miss all your shots against us. The role of a curling coach is a bit different than other team sports. Whereas the rest have a top-down approach, curling teams pretty much form themselves, then insert a coach to round out their dynamics. During a game, there is (by rule) zero interaction between coach and players except for player-initiated timeouts. Between games, Howard’s 17 Brier appearances and 16 Grand Slam titles will no doubt help a world-class team strengthen their tactical approach. The squad’s battle tested, but when Howard won his first world title in 1987, nobody on Great Britain’s team had yet been born. It’s not unheard of for active curlers to coach other teams. John Epping, whose team has a direct berth into the Roar of the Rings, coached Kerry Galusha’s team from the Northwest Territories in the 2017 Scotties and gave the perennial Canadian championship cellar dwellers some extremely helpful structure. Mike McEwen’s vice-skip B.J. Neufeld is coaching a team led by Briane Meilleur— B.J.’s wife Sarah plays lead—into the Canadian trials. Even the aforementioned Richard Hart coached Rachel Homan’s top-ranked team for the last two years. One can do both, but the Olympics is another story, as is doing it for two different countries. In fairness, that’s a long way off. First, Team Howard will need to be one of two teams to advance out of the 14-team Road to the Roar, then win the Roar of the Rings, a quadrennial tournament with nine teams and a batshit atmosphere—perhaps a better one than the Olympics itself, as whoever walks out of that tournament with the maple leaf is almost guaranteed to grab an Olympic medal. On the off chance that Howard’s team does represent Canada, which at this point is probably as likely as, say, the Orioles winning the World Series, he may be able to pull it off. There would be no time conflicts (the men and women alternate game times), but that would give him basically zero breathing room to spend with his own teams to talk shop and rest. All of this could lead to a level of whimsy that the climactic scene Mrs. Doubtfire wishes it could create. Howard did not respond to an inquiry about this, but ultimately I would imagine Howard wouldn’t worry about a decision unless he did win the Canadian trials, at which point he would step down from his coaching duties. It wouldn’t be fair to anyone, though it might be comical to us. As is the case in sports in which you don’t really have a deep rooting interest, root for the weirdest outcome.